One of my favorite insect of all time is the bumble flower beetle, Euphoria inda. We don't get to see this insect very often in Iowa, but for whatever reason there have been more reports and samples this year than in the recent past. The bumble flower beetles are medium-sized scarab beetles that feed on nectar and pollen from flowers, on fermenting plant sap, and on overripe and rotting fruits and vegetables. An alternate name for these insects is the brown fruit chafer. See the photo below. 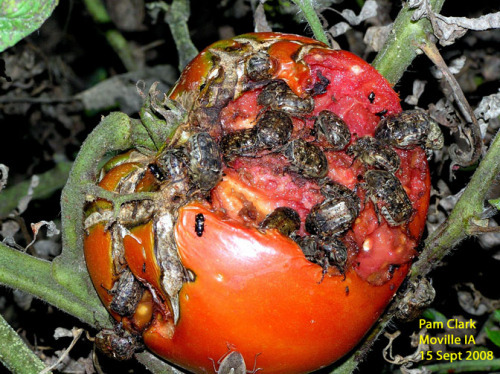 Recent client inquiries have reported damage to tomatoes on the vine and beetles clustered at tree wounds. The beetles are attracted to fermenting plant sap, hence their accumulation in the reported locations. The bumble flower beetles are opportunists that take advantage of cracks and openings that already exist. Bumble flower beetles are not a common pest problem in Iowa. When they do occur in the garden the practical control is sanitation. Remove all cracked, overripe and damaged fruits and discard infested tomatoes far from the garden. Pick tomatoes slightly ahead of fully-ripe if necessary. There will be little to no benefit to spraying for these scavengers. It's interesting to speculate why this scavenger, of all the insects, was given the genus name Euphoria. I suppose the name fits when you see the euphoric feeding frenzy of dozens of beetles wallowing in decaying fruit. See the photo below. 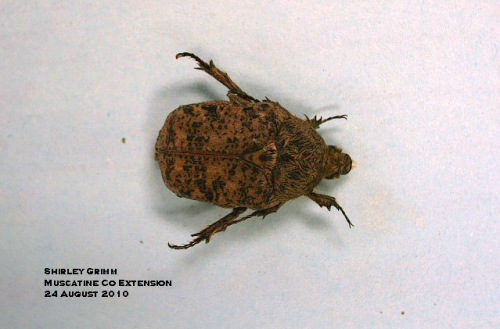 I have vivid memories of collecting this beetle in Florida 40 years ago. I picked up a dropped, decayed orange that looked whole, but it was only the rind; the insides contained easily over a hundred of these beetles that had eaten away most of the interior. For more details about the bumble flower beetle, see BugGuide. The bumble flower beetle is one-half to two-thirds inch in length, mottled brown and fuzzy. In flight, it buzzes like a bumble bee! Bumble flower beetles attack damaged fruit en masse! The smaller black insect, the four-spotted sap beetle, aka "picnicbug" loves damaged fruit, too. Links to this article are strongly encouraged, and this article may be republished without further permission if published as written and if credit is given to the author, Horticulture and Home Pest News, and Iowa State University Extension and Outreach. If this article is to be used in any other manner, permission from the author is required. This article was originally published on September 12, 2014. The information contained within may not be the most current and accurate depending on when it is accessed.